The target for every dairy farmer is to maximise productivity for the lactating dairy cow while controlling production costs. Many management factors are involved in successful production including worming of the dairy cow. Previously it was assumed that adult cows could easily deal with parasitic infections. However, current evidence demonstrates the negative impact that gut worms can have on production. This can be divided and measured into clinical and sub-clinical effect. A clinical observation would be scouring and coughing. Sub-clinical can be more difficult to detect but can be the major contributor to reduced productivity. Adult dairy cows can harbour large numbers of gastrointestinal parasites mainly ostertagia. The demands of lactation mean a small number of parasites can have a large economic loss versus a suckler cow with the same infection. Gut worms can also impact on the immune system therefore reducing the cow’s ability to deal with infection. Any drop in production during peak lactation when persistency is critical for profitability is to be avoided. A wet spring carried over and increased worm population loading on grass. Cows and young stock have consumed grass containing a heavy worm burden. The worm life cycle averages 21-28 days later, now causing health issues in the lung, stomach and bowel of livestock. Coming from a current dry period in weather conditions at present, rain will cause an increase in infestation of pastures as larvae will leave dung and soil where they retreated to in the dry conditions. Therefore assess your worm strategy in covering an infestation that could arise as the weather changes to protect your herd. 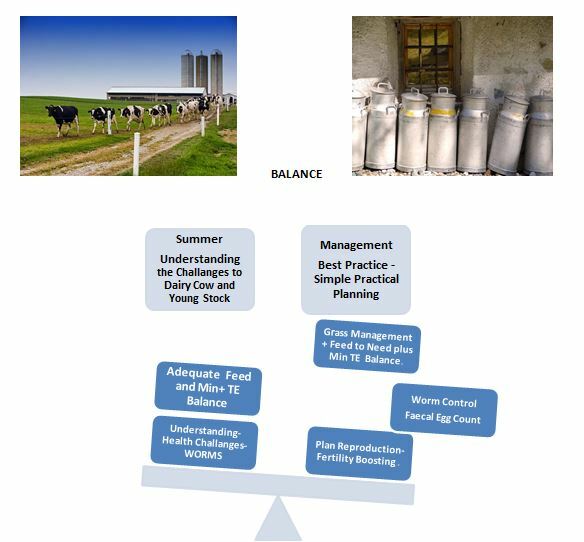 Cows and young stock need care and support Facilitate faecal egg count or milk sample tests to determine worm burden level and consult with your herd health advisor. Treat with approved Eprinomectin based products only. An investment in replacement heifers is an investment in the future of the herd.